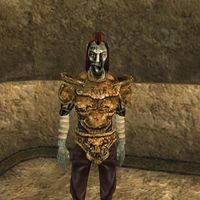 Eldrar Fathyron is a Dunmer merchant located in the Canalworks in Vivec Telvanni Canton. His merchandise are slaves. He wears a bonemold cuirass with matching pauldrons and boots and a common shirt with matching pants. He carries a steel frostsword, a few keys that can free some nearby slaves (see notes). Aside from his natural resistance to fire and the sanctuary provided by his ancestors, he knows no spells. When asked about latest rumors, he will tell you: "The Bemis gang has taken up in the tombs somewhere under Vivec. I hope the guards catch them soon." Eldrar Fathyron holds a key that can be used to free the nearby slaves Dro'Qanar, El-Lurasha, Inerri, Mim-Jeen and Wud-Neeus. This page was last modified on 26 March 2015, at 12:28.